The most delectably easy flourless Almond Butter Zucchini Bars! 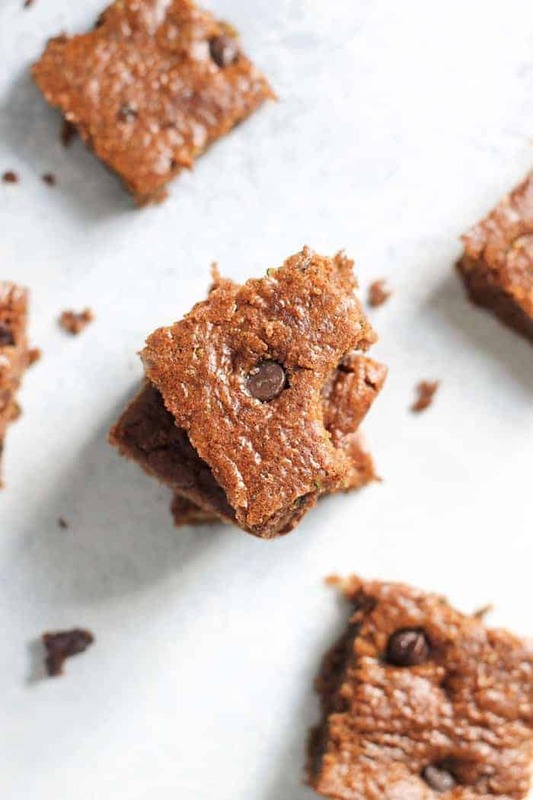 These gluten free, one-bowl bars are made with wholesome ingredients and satisfy any sweet tooth. I didn’t know everything in 2013, but I sure as heck had my dessert hat on straight! Ya see, these fantastical Almond Butter Zucchini Bars were originally published in 2013, i.e. the golden days of blogging. Back when like, no one had a blog. The internet was such a different space! The iPhone pictures for the old version of this post were LOL-worthy and needed a serious update (as did the post copy); so here we are! I know you have buckets of fresh zucchini oozing from your refrigerator and trunk and sock drawer so I’m gifting you with the best way possible to use it. Also, try slicing and freezing it to add creaminess to smoothies! 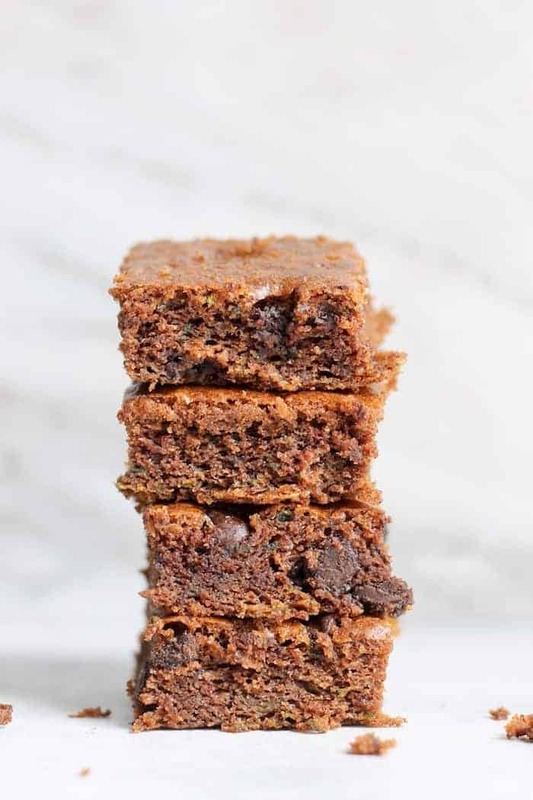 The only thing I changed about this naturally gluten-free Almond Butter Zucchini Bar recipe was decreasing the nutmeg to 1/4 teaspoon, which is perfect for me. And yes, 2 teaspoons of cinnamon is correct! Don’t skip it. As far as an egg substitute in this recipe for my vegan friends, unfortunately I don’t have one. I tried this recipe with a flax egg and it was all crumbly. I used pure maple syrup for the sweetener, but honey should work well too. The chocolate chips are “optional” because chocolate-haters still deserve to love this recipe but honestly, I don’t get you. The best part about these Almond Butter Zucchini Bars is just that—they’re made with ALMOND BUTTAH as the base rather than flour. Kinda like my epic Pumpkin Bars and Fudgy Raspberry Almond Butter Brownies, ya dig? Obviously I love me some flour (hi, fluffiest pancakes ever) but I’m equally excited by a recipe that’s ridonculousy moist and oh so fluffy from nuts. The thought! I use Kirkland’s creamy almond butter from Costco in this recipe but any drippy almond butter should work, like Trader’s Joe’s creamy almond butter for example. Also, does anyone else own this 4.5 pound bag of chocolate chips? Cuz you know I do! They’re dairy-free and super affordable and TBH you can never have enough chocolate in the house. Oh, and they only have ten ingredients. And one bowl. You’re welcome! Nosh on these bars for snack, dessert, breakfast, dinner, you do you, honey. These Almond Butter Zucchini Bars are absolutely fab with a cup of hot (or iced!) coffee but I love them equally when enjoyed after dinner with chilly almond milk whilst watching The Americans. Pre-heat the oven to 350F. Spray an 8x8in baking pan with cooking spray. Set aside. Stir together almond butter, zucchini, egg, maple syrup and vanilla in a large bowl until combined. Stir in baking soda, cinnamon, nutmeg, and salt. Fold in chocolate chips. Bake at 350 for 30 minutes or until a knife comes out clean. Yum, this looks good! I’m going to need to pick up a zucchini soon! My son is has gluten, dairy n peanut/almond allergies. Can I use sunflower butter or cashew butter in place of almond butter? I would really like to try this recipe. Also, where can I find that huge bag of dairy free chocolate chips? Hi Donna, I haven’t tried it with another nut butter. As long as it’s drippy, not solid, I’d imagine it would work. I linked to the bag of chocolate chips, which you can buy at Costco or on amazon. Trader Joe’s chocolate chips are also dairy-free. Enjoy! Wahhhooooo!!!! I love a good success story :) I wish I could come to Chicago and bake with you guys! You had me sold on these with the title! I have made chocolate zucchini muffins before, but I love your addition of almond butter. These sound super tasty :). I lovelovelove chocolate zucchini muffins! I always make the ones from Happy Herbivore and add chocolate chips. Beyond heavenly. Those are exactly the muffins that I was referring to! Happy Herbivore rocks :). Thanks, Sally! I’m pretty much head over heels in love with them…there’s no denying it. You’re right–you really can’t go wrong with almond buttah! thanks for the sneak peek! Christen and I made them Sunday and they are beyond good!! I just wish we had made two batches! Any time, Care. I’m so glad you liked them!! Thanks, Matt! They’re darn tasty. I just can’t get my head around green monsters but hiding veggies in a zucchini bread? Now THIS is something I am on board with! Do you think subbing in peanut butter for the almond butter and honey for the maple syrup would work? I’m trying to work with what ingredients I currently have at home! I wondered about the peanut butter thing, too! I wouldn’t recommend subbing because the magic thing about almond butter is its ability to NOT make things taste like super almondy. It just makes them super moist! I think using peanut butter would turn these into peanut buttery zucchini bread, which doesn’t sound too fabulous to me. I also don’t know if the texture would work. So basically I’d recommend sticking with almond butter but let me know if you try it out! I know this post was from a few years ago, but I substituted peanut butter for the almond butter, since it was the only kind I had on hand, and they still turned out fabulous! The peanut butter didn’t overpower the taste at all and they were as soft as could be! what a great idea: zucchini and almond butter! i’m sure the flavors complemented each other! i just made granola bars (not Paleo) with almond butter, yielding great results. Yummmm I’m excited for that granola bar recipe! These look amazing! I gave up sweets for Lent so these look like the perfect thing to satisfy my cravings :) What else do you recommend adding to these bars besides the chocolate chips? These will definitely satisfy your craving, Amber! Feel free to just leave out the chocolate chips. They’re a yummy addition but they’ll still taste fabulous without them! I bet coconut would be good too. Hi! Just made these and they are outrageous! I have such a sweet tooth and try to eat as clean as possible and this was the perfect treat. Mine came out a bit mushy though. Are they suppose to be like that? Any suggestions? I’ve been excited to try out this recipe for a while and I finally did….delicious! The only thing I did different was that I added 1 heaping Tbsp. of cocoa powder because I only had a few chocolate chips and really wanted the chocolate flavor. I’ll definitely make these again. These are great! I have made them five times in the past month! I have been having a chocolate craving, so today I added 1/4 c. cocoa powder to the mix. Delish! I’m so glad you’ve been enjoying them, Elisabeth! Great idea to add cocoa powder, too! YUM. Made these three times already and loved them! I made them with a quarter cup each of chocolate chips, walnuts and coconut…cannot get enough! Thanks so much for the recipe! Fabulous to hear, Fiona! OMG–the addition of chocolate chippers, walnuts and coconut sounds amazing. I’ll have to try that soon! These are in the oven right now… Yeah! Hope you love ’em, April! That makes my day, April! Thanks so much for the sweet comment. They really do make the apartment smell fabulous! 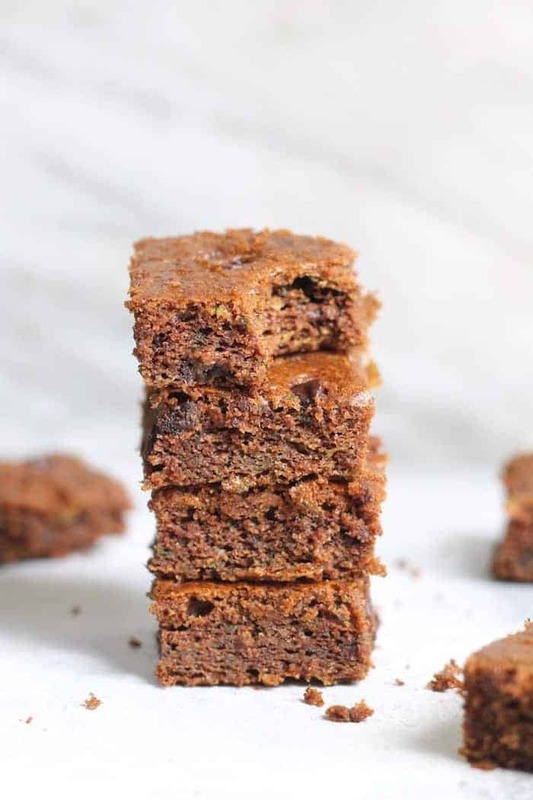 I made these last night and they were delicious!–I used honey instead of maple syrup I am on a gluten free diet and have been trying a variety of new recipes–this is a keeper. I brought one to work for my boss to try and he loved it too. Thanks for the recipe. That’s so great to hear, Missy! They’re such a fab treat. Glad to know your boss enjoyed ’em, too :) Baking with almond meal and almond butter is the best discovery, especially for those who eat a gluten-free diet. OMG Thanks! I love this website and I can’t wait to try the recipes! I’ve made these several times now and tried them with sunflower butter–if you haven’t tried it, it’s fabulous! I’m overjoyed to hear that, Missy! Since TJ’s has been out of almond butter forever, I’ve been using sunflower butter way more. I love the flavor, so I’ll have to try it out! Thank you, Alexis, for sharing your expertise and your love of healthy food. I love that I stumbled onto you!! My dessert the last two nights consisted of your strawberry-chia seed pudding, and your zucchini almond butter bars. My only issue is that these recipes taste so good that I need to be careful and not chow down on too much of this delicious healthiness! Thanks for your sweet comment, Dennis! You are SO welcome. I really need to whip up a batch of that chia pudding…it’s been too long!! These came out great–very interesting flavor. I added a tablespoon of unsweetened cocoa powder. YUM. Thanks for posting the recipe! What an awesome recipe! How do you store them and how long do they last? I need a yummy healthy go to snack for my 2 year old and this sounds perfect! I made these vegan by using a flax egg, and they turned out perfectly!! I’m so glad to know that works! Thanks, Kendell! These look delicious! Will veganize and free it of sugar and hopefully have it taste/look just as good! I just found this recipe on Run To The Finish under Almond Butter Recipes and I am in love! I’m going to the store to buy almond butter immediately because these HAVE TO HAPPEN. I’m not even Paleo or Gluten Free or any of that jazz, they just look really gooey and yummy and guiltless. Thanks for sharing and I love your site! Hey Kathryn! So glad you like the recipe! I’m not paleo/gluten-free either, but it’s always so fun to experiment :) Enjoy! Am I missing something? Just made these, followed the recipe to a tee and ended up with warm mush at the end (incredibly tasty mush but mush all the same). Even cooked it for an extra 5mins. Is there meant to be almond meal in this as there is none listed in the ingredients? Hmmm I haven’t heard of this happening before. The recipe usually works as is! Not sure what happened here :/ I hope it works out next time! Oh. My. Gosh. These bars are to DIE FOR!!! Yayy!!! I’m so glad they turned out well for you, Barrie! I was just wondering, if I wanted to make this in a loaf pan, at what temperature and for how long should I bake it? could I sub in mashed ripe bananas for the syrup/honey? If yes, how many (1/4c)? Made these this morning and it was a hit with my kids and coworkers. Just fyi – I didn’t strain the zucchini and I used honey. I had to cook it maybe 10 minutes longer than the recipe said in my convection toaster oven. But it was well worth the wait. I love me some almond butter! Love this recipe! Its great that it isn’t too sweet and perfect for mornings on the go! Yummmmm! I only have a jar of maple caramel almond butter that, unfortunately, is not the drippy kind. But as soon as I have a jar and zucchini, I’ll be making these! I made these for my kids and we all loved them. They were delicious. I always like zucchini bars but these were so much better than most. I’ll be making them again. Hi Alexis! I love the bars. I baked some over the weekend using your recipe. Thankfully, they turned out right. My son loves them. Thanks again! So glad to hear, Andy! I NEED to make these!! I’m looking at the pictures and ingredients list and basically drooling! Best snack ever! Thanks for sharing your recipe, Alexis! I shared it with my wife. OBSESSED with these and honestly make them on the reg. I sub flax egg, since I have an egg sensitivity, which works really well too!